You know the saying, “the first drug is always free?” That’s how my friend Maurice convinced me to experiment with large format. 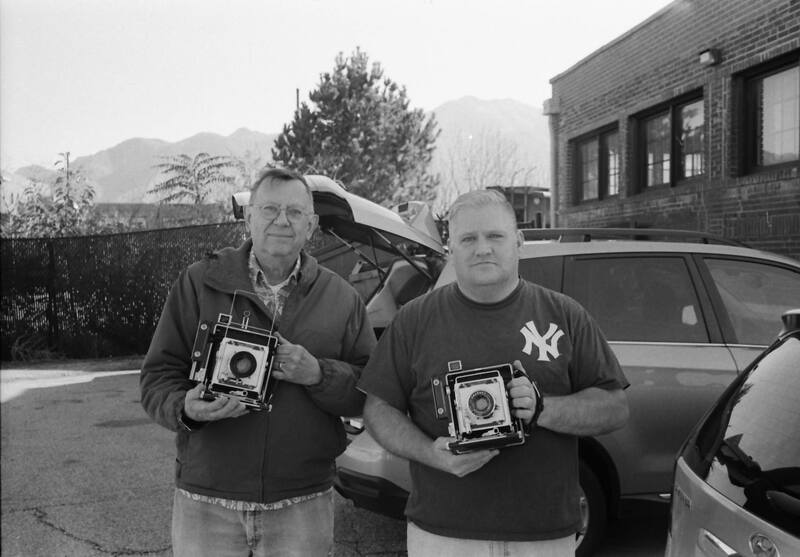 Late last year, he asked me if I would be interested in trying one of his Graflex cameras. He even sweetened the deal by loading some Arista 4×5 film into the film holders, and volunteered to develop them. On a Saturday morning, he gave me hands-on lesson and answered all my questions. The Pacemaker Crown Graphic was manufactured from 1947 to 1973 by Graflex Inc. Made of mahogany wood and metal, the Pacemaker has a side-mounted rangefinder focus, but does not have a focal plane shutter like nearly identical Pacemaker Speed Graphic. To give the camera access to a variety of wide-angle lenses, and to reduce the overall weight, it was made without a focal plane shutter. My Pacemaker was manufactured in 1955 and features a lens board with a 135mm Graflex Optar lens, f/4.7 – 32, and shutter speeds 1/400 – 1 sec. Photographers often describe their satisfaction of shooting film as: it allows me to slow down. Using a large format camera, like a Graflex, takes that same notion and multiplies it. Everything from setting the camera up to the final click of the shutter is a deliberate, leisurely, and enjoyable process. After shooting the film that Maurice had loaded, I returned the camera and film holders to him. He told me that he was likely going to sell the Pacemaker and offered it to me. A few days later, I returned and bought the camera from him. Maurice also threw in the book, Graphic Graflex Photography: The Master Book for the Larger Camera (1943), 8 film holders, and a Polaroid 100-series Packfilm holder. Adding to my new large format arsenal, I bought the SP-445 Compact 4×5 Film Processing System, along with New55 Atomic-X and Kodak T-Max film. For me, developing black and white 4×5 sheets are easier than 35 or 120. And it’s exciting to see a large 4×5 negative with so much detail. Compared to a digital camera sensor, a single sheet of 4×5 film provides more “data” than you can possibly imagine. Learning with some additional practice, I plan to create more 4×5 images with better composition and depth of field. However, I am happy with my first attempt with large format photography. I have to admit something that every photographer has done at least a dozen times. I coveted my friends Leica cameras. Maybe coveted is too strong of a word, but I’m a sucker for a good rangefinder camera, but also aware that my funds don’t allow me to possess a Leica. However, I can afford a Zorki! The Zorki 4 was manufactured by KMZ, Krasnogorsky Mekhanichesky Zavod, from 1956 to 1973 near Moscow in the former USSR. This model was one of the most popular because it was exported from Russia to the western world. The Zorki 4 features a cloth focal plane shutter, with shutter speeds from 1s – 1/1000s. According to some research, there were at least 32 versions of the Zorki 4 released during its 17-year run. All of the changes were cosmetic, either by changing the way the camera name was printed (or engraved) along with anniversary models or commemorative editions. The model that I purchased was manufactured in 1963 (Zorki 4B), indicated by the first two-digits in the serial number. The Zorki 4 uses the old Leica M39 lens screw mount. The cameras were sold with either a Jupiter-8 50mm f/2 or Industar-50 50mm f/3.5 lens. I chose to purchase a model with the Jupiter lens because of the reviews I’ve read and comments from friends. Overall, this camera is built like a tank, a Russian tank. The camera is easy to focus, and the viewfinder is bright. If I compared it to a pre-war Leica, like most photographers do, I would say that the sound of the shutter, and the feel of the camera are exactly what I’d expect. One disadvantage of the Zorki 4 is the viewfinder. It’s is so big that you don’t know where the edges of your framed shot are, or where they should be. Ideally, it should have been designed like other rangefinders at the time with faint boarder lines in the viewfinder. Image composition is difficult. I love that this camera is all mechanical, no batteries, and no meter. The Jupiter lens is easy to focus and provides nice depth of field. One of the best pieces of advice I read online before pulling the trigger on eBay was; you get what you pay for with the Zorki. Most are shipped from sellers in Russia and normally the price indicates the condition and functionality of the camera. Of course you always want to check seller feedback, current sold and shipping prices. My test images were shot on Film Photography Project’s Edu 200 BW Film. Currently I have some Svema BW Super Positive ISO .8 BW Film from the Film Photography Project loaded in the Zorki. Russian camera, Russian film, отлично! The camera review this week was a donation from Mike Williams in Hickory, North Carolina. Mike found the 7s at a local yard sale for $5.00 (US) and shipped it out west. Make sure to check our Mike’s current project on Youtube, 12 Months/12 Cameras, where he shoots an entire month with a single camera and shares a video review. The Petri 7s was manufactured by the Petri Camera Company from 1963 – 1976. Features: coupled rangefinder focus, around-the-lens selenium light meter, shutter speeds from 1 to 1/500 sec, and a 45mm f/2.8 – 16 lens. The Petri company called their rangefinder focus system the Green-O-Matic because the overall viewfinder is tinted green while the focusing area is yellow. The idea was that contrasting colors made it easier to focus. After the Petri 7S arrived, I purchased a telephoto and wide angle diopter set from a user in a vintage camera group on Facebook for $12. The diopters are screwed in to the 52mm thread mount, and the viewfinder is attached to the camera cold/accessory shoe. My results with the diopter set are mixed. This is the first time I’ve used diopters with a rangefinder camera. In the digital world, my experience with adding more glass in front or behind a lens results in difficult focusing and poor image quality. The selenium light meter on the Petri 7s circles the lens. This design was initially created to allow the meter to read the light behind an attached lens filter. The camera has two match-needle meters. One is visible in the viewfinder, and the other on the top of the camera body. In this particular 7s, the needles on both do not display the same reading. In some of my images, I tried to split the difference between the two with little success. I had much better results metering with my Gossen Luna Pro S handheld meter. You can find the Petri 7s for as cheap as $8.00 (US) on eBay, and there are a lot of them. While I really enjoy a good rangefinder camera, this one ranks towards the bottom of the list. And not because of the meter issue. That’s almost expected with a selenium meter on a camera that’s a) this old and b) you don’t know how it was stored. My test images were shot on Film Photography Project’s Edu 200 BW Film. There was some scratching on the negatives in most of the images that I intend to investigate. If I had to pick a rangefinder from 60’s or 70’s, I’d consider a Yashica or Minolta over the Petri. However, for less than twenty bucks, it was worth the gamble. Do you have a any of the Petri rangefinders? I’d love to hear your thoughts in the comment section below.